She was an orange kitten with deep green eyes, no bigger than the palm of my partner’s hand. Mara had been rescued from a drain in Sujan Singh Park by my cousin, and was temporarily living with them and their three dogs. “We have to find someone to adopt her!” said Kamini. “It’s the other way around,” said Kamini with some feeling. Mara had discovered a wonderful game—she would hide on the top of the bookcase, waiting for an unsuspecting dog to pass by, scoot down, smack him on his nose and scoot back up before he’d even seen his tiny attacker. So we rescued the dogs from Mara by adopting her. I’d never lived with animals before; a close family member had asthma, and though I smuggled pigeons, kittens and puppies in, they all had to be relocated in short order. Except for a brief stint babysitting a mongoose, I’d spent much less time with animal companions than my husband had—his impressive credentials included looking after a pig, a monkey, a very gentle python and a carnivorous rabbit who liked hamburgers. Mara, inquisitive, intelligent and fearless, opened up a parallel universe. She was a friendly kitten, unwilling to share the two of us but otherwise curious about the strays—cats, dogs, monkeys, birds—who lived in most Delhi colonies. In time, other cats joined our family; and our indoor cats attracted a horde of visiting strays who had designs on their food bowls. The inside cats and the outside cats watched each other with avid curiosity. If we picked up Mara and cuddled her, the eyes of the visiting strays would widen in incredulity. But if we were lucky, they were more inclined to trust us, even let us cuddle them, once they’d seen us with the inside cats. Seen from a foot off the ground, Delhi is a different city, Nizamuddin a richly alien neighbourhood. Books on cat behaviour confirmed what I’d begun to suspect: cats were extremely social loners, extrovert-introverts if you like. Most cats lived in loose but protective clans. The queens—the female cats—dominated the clan, but there was always an alpha tomcat or two backing up their reign. The toms swaggered across the neighbourhood, brawling, yowling, always in trouble; the queens were often ferocious hunters, and both toms and queens were surprisingly caring parents. If there were too many kittens in any given season, the toms would cull them ruthlessly, but otherwise the toms were endlessly patient with the kittens who tumbled around in their wake, and the queens were stern but loving mothers. I learned other things: cats seemed so often to be silent, not mewing or purring except in occasional bursts of conversation, but they were constantly chatting. Their whiskers and their noses brought them all the news of the world they needed. I began to wonder: what if there was a cat who had longer, more sensitive whiskers than usual? What if she could roam wider and further than any of the other cats, just using her whiskers? Would the clan love and protect a cat like that, or would she be cast out for being different? In 2007, I wrote a short story about a kitten with deep green eyes who lived indoors with humans because the outside world felt too large and scary for her. It was fun to write. I began to write another story, set in the same world, and two cats strolled into its pages. One was a wise Siamese whose blue eyes told me she had stories to tell that I couldn’t even imagine, the other was an alpha tom, loved and respected by the other cats of his clan. Halfway through telling those stories, Mara got sick. The vet told us she had feline diabetes. Over the next few months, our little orange warrior lost weight until she was down to fur and bone, but she took her illness stoically, not protesting the visits to the vet, the many injections, the drips, the pain. Our second cat, Tiglath, watched for her to come back from the vet; we’d find him at the head of the stairs, mewing. Mara had groomed and washed him when he’d come to us as a tiny kitten. Now he spent his evenings grooming her ears, her tail, her fur, washing her as gently as she had once washed him. At night, Mara curled up between us, her thin ribs rising and falling in shallow breaths; but every morning, she wanted to be on the verandah, and her eyes would follow the cheels, the sparrows, our other two cats. She died in my arms, shortly after. She took a calm, slow breath, her green eyes closed, and though I listened for a long while, she did not take another. I put the stories aside until 2010. When I read them again, it seemed that I had captured only the tiniest corner of Mara’s world. Where were the cheels who seemed to have arrived at an interesting and complex truce with the cats we knew in Nizamuddin? Who was responsible for the brawls we heard at night on the rooftops at the dargah, those dark dramas of yowl-and-counteryowl? I waited impatiently for someone else, a real writer, to write the book I wanted to read, until it began to dawn on me that there might not be too many writers out there fascinated by the secret life of cats. Aliens, yes, vampires, yes, daemons and demons, absolutely. But cats had few champions. This seemed grossly unfair. Though I read everything I could find on cats and feline behaviour, the real research required getting out of the house and walking for as long as I could. The more I walked around Nizamuddin’s grand sprawl, the more cats I met, hurrying to the dargah, taking their kittens for a walk on the canal road, gingerly sidestepping us humans or the stray dogs. I looked at the line of question marks. “What happens next?” they asked me. So I sat down at the computer, and did my best over the next two years to come up with an answer. That became The Wildings; and two years after that, in 2013, the fictional Mara grew up. You can read what happened to her in The Hundred Names of Darkness. I just found your book The Wildings at the library at which I work in Portland, Oregon (USA) and will recommend it as widely as I can. I’ve read stories with cat protagonists before, one strangely enough written by another Indian journalist named Pallavi Aiyar (titled Chinese Whiskers,) but none as richly detailed and with as appealing characters as your novel. Most are juvenile fantasies with more details about magic than about cats. I love the world of your wildings even more for the inclusion of other creatures: the cheels, brave mice and squirrels, zoo animals and the mysterious mongoose. Thanks very much for a week of fascinating entertainment – I look forward to the sequel and wish your other books were available to me. I can’t even get The Girl Who Ate Books through interlibrary loan! Oh, and I enjoyed reading this little bit of background on Mara, even though it reminded me of the recent loss of my favorite cat George. Thank you! And it’s wonderful to think the books have travelled so far. the US in a few months. at the edges, over time. Wow, thanks so much for taking the time to reply! I’m sorry I didn’t see it until now. Adopting kitten twins Merwin & Myshkin (we always give our cats literary names) helped to console us for the loss of George. Kittens can help with almost anything! Meanwhile I have read & very much enjoyed 100 Names of Darkness & will look for the other book (Girl Who Loved Books.) And I hope to see many more from you! By the way, have you read any Ursula Le Guin? I love Ursula K Le Guin, heard recently that The Left Hand of Darkness will be made into a movie, and can’t wait to see it. Just finished reading The Wildings and boy did I enjoy every bit of it. It took me back in time to when I was a kid and had only my cats for company while my parents went to work. I used to observe them throughout the day and try imagine what might be going through their heads. I had always thought that cats never liked being smacked on their behind. Reading your book just reaffirmed that notion. It seems to me that you really know your cats! 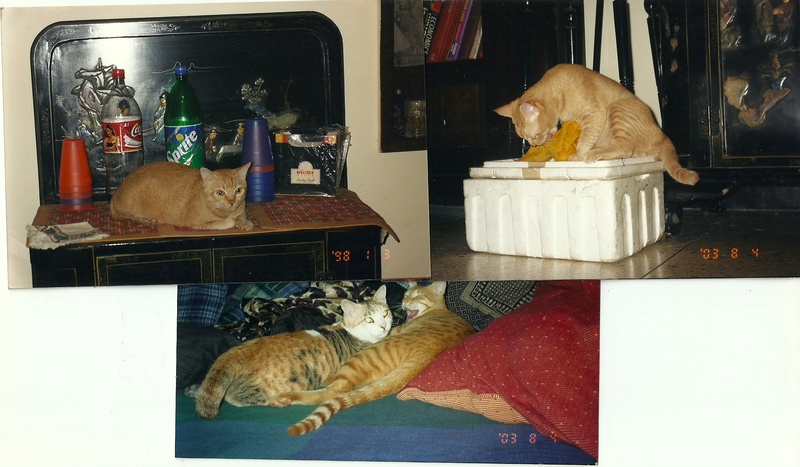 I haven’t seen my cats in a long while as I recently shifted to Delhi. Been thinking of adopting one from Friendicoes, but I’m not sure if I’ll be able to look after all the time it as I’m always caught up with work these days. Also, Mara looks so pretty. She is quite a poser too. I know how hard it is when one’s pet dies and I’m sure Mara’s death would have been one of the toughest moments in your life, but I should say I am glad that you made Mara the protagonist of your book. I’m sure she deserves it. Just bought The Hundred Names Of Darkness and can’t wait to turn its pages. I’m sure it’ll be as insightful and entertaining as the first book. Thank you Nilanjana for making me feel nostalgic and a good Bigfeet again. Loved reading this. And both the books too!